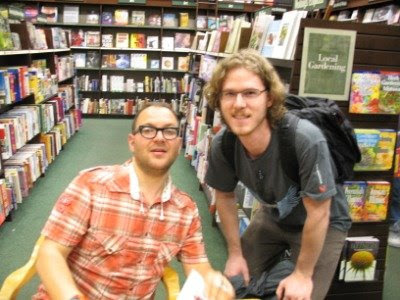 I'm a big fan of Cory Doctorow, the person, the advocate, and the author. He's extremely eloquent, funny, and grounded. 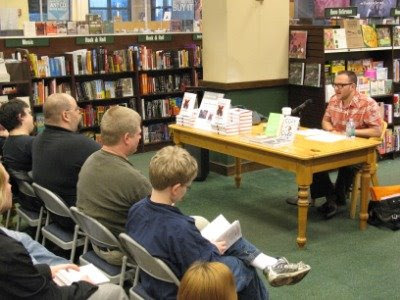 I got the chance to meet Cory tonight at a reading of his latest book, Little Brother — which is fantastic; I couldn't put it down. I gave Cory a Banshee shirt and told him about our upcoming 1.0, since he's a GNU/Linux user (his words and his actions speak volumes) and he popped into #banshee a while back. Anyway, if you haven't seen Cory speak, he's able to explain difficult, technical issues to non-techies in a way that they can understand and makes geeks proud. I'm happy to have finally met him.